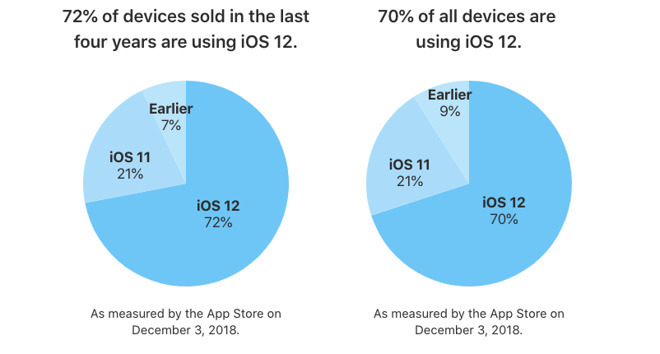 Released in Apple's Developer Site, the latest results as of December 3 advise iOS 12 is installed on 72 percent of all compatible iOS devices released in the last four years. Of the remainder, iOS 11 is running on 21 percent, while the last 7 percent combines all earlier iOS releases. Expanding the results to all devices in use, iOS 11 is used on 21 percent of hardware, with a 70 percent share occupied by iOS 12, and a combined 9 percent share for earlier releases. The data indicates that iOS 12 is being adopted by users at a far greater rate than when iOS 11 was released and had to acquire an install base from iOS 10. Similar results released in December 4, 2017 covering all iOS devices revealed only 59 percent had moved onto iOS 11 by that time, with 33 percent still running iOS 10. Given the latest figures, it is highly likely that iOS 12 will continue to outpace its predecessor. Data from April showed iOS 11 was installed on 76 percent of compatible devices, an 11-percent increase from the start of the year until that point. Since iOS 12 is already at 70 percent for all devices, it is probable that iOS 12 will hit 76 percent months earlier than the time it took for iOS 11 to do the same. In October, iOS 12 reached 50 percent adoption of all compatible iOS devices. The faster adoption of iOS 12 has also been revealed by third-party firms, with Apple's results seemingly confirming them to be fairly accurate. Figures from Mixpanel revealed iOS 12 passed the 75 percent milestone on November 26, beating iOS 11 to the figure by a few weeks. While Mixpanel and other analytics services use third-party app and merchant data to determine operating system usage, Apple's figures are thought to be far more accurate, as it relates to iOS devices that contact the App Store and Apple's other online services. While considered to be more accurate as it is direct from the source, Apple's data is also released far less frequently than the third-party analytics tools, which can sometimes make comparisons with earlier iOS releases harder to make.